CHESTNUT HILL, Mass. – Boston College and the Atlantic Coast Conference announced the 2019 football schedule on Wednesday. The Eagles have six home games at Alumni Stadium, including the season-opener against Virginia Tech on Saturday, Aug. 31. Boston College returns nine starters, led by junior running back AJ Dillon and redshirt junior quarterback Anthony Brown. BC returns six starters on offense after the Eagles’ fifth bowl appearance in six years under head coach Steve Addazio. The 2019 schedule features three games against teams in the initial ESPN.com 2019 preseason rankings, including trips to No. 1 and defending national champion Clemson, No. 5 Notre Dame and No. 15 Syracuse. Boston College plays four of its first five games at home to start the 2019 campaign. For the second time in four seasons, Boston College opens the year against an ACC opponent as Virginia Tech visits Alumni Stadium on Saturday, Aug. 31. It marks the fourth time since BC joined the ACC in 2005 that the Eagles will begin the season against an ACC foe. Last season, BC defeated the Hokies 31-21 in Blacksburg. Overall, Virginia Tech leads the all-time series 18-9. BC hosts Richmond on Saturday, Sept. 7 for the sixth meeting all-time between the two schools and the first since a 24-0 win at Richmond for the Eagles in 1971. BC leads the all-time series 4-1 in a series that began in 1951. Boston College and Kansas meet for the first time in series history on Saturday, Sept. 14 at Alumni Stadium. First-year head coach Les Miles leads the Jayhawks to the Heights for the non-conference matchup. All-time, the Eagles are 22-28-1 against current Big 12 members. The majority of those games, 33, were against West Virginia when the two schools met both in non-conference matchups and as members of the Big East. BC hits the road for the first time in week four as an old eastern football rivalry is renewed at Rutgers on Saturday, Sept. 21. The two teams first met in 1919 and have faced each other 26 times in series history. Both schools were conference foes in the Big East from 1991-2004 before the Eagles joined the ACC in 2005. Boston College leads the all-time series vs. the Scarlet Knights 19-6-1. BC has not lost to Rutgers since a 20-13 defeat in 1991, the first Big East conference game. The Eagles are unbeaten in their last 13 meetings against Rutgers (12-0-1). ACC play resumes on Saturday, Sept. 28 at Alumni Stadium against Wake Forest. The Eagles secured a 41-34 victory on the road at Wake Forest last season. BC is 14-10-2 all-time against the Demon Deacons, including a 9-7-1 mark at home. The first road ACC tilt of the year takes place at Louisville on Saturday, Oct. 5. BC has won two straight games against the Cardinals, including last year’s 38-20 win at home. BC is 5-6 in series history against Louisville and won its last time in Louisville, 45-42, in 2017. Following a bye week, the Eagles return home for their only October home game against NC State on Saturday, Oct. 19. Last year, the Wolfpack earned a 28-23 victory over the Eagles in Raleigh. All-time, BC is 9-7 against the Wolfpack, including a 6-3 record at Alumni Stadium. For the third time in six seasons, BC will face the defending national champions as the Eagles head to Death Valley to face Clemson on Saturday, Oct. 26. In a series that began in 1940, Boston College and Clemson meet for the 29th time with Clemson leading the series 17-9-2. For the 12th time, Boston College and Clemson will play for the O’Rourke-McFadden Trophy after the BC Gridiron Club established the award in 2008. November begins with a road trip to Central New York to face the Orange of Syracuse on Nov. 2. The Orange captured a 42-21 win at Boston College in 2018. The last time BC played inside the Carrier Dome, the Eagles rolled to a 42-14 victory over the Orange in 2017. All-time, Syracuse leads the series 32-20. BC closes out its 2019 home schedule against Florida State on Saturday, Nov. 9. The Eagles trail the all-time series 12-5. It marks the first visit to BC for the Seminoles since the Eagles rolled to a 35-3 win over FSU in 2017. Last season, FSU scored in the final two minutes to stun BC, 22-21. After a bye week, old rivals meet on Saturday, Nov. 23 in South Bend, Ind. as the Eagles visit Notre Dame. The Fighting Irish lead the all-time series 15-9 as the two teams square off for the first time in South Bend since 2011. BC will look for its first win against Notre Dame since a 17-0 victory in 2008 at Alumni Stadium. The 2019 regular season wraps up at Heinz Field on Saturday, Nov. 30 against another old familiar foe in Pitt. The Panthers and Eagles meet for the 31st time in series history and for the first time since 2014. BC has not played at Pitt since a 20-17 overtime loss in 2004 when both teams were in the Big East. 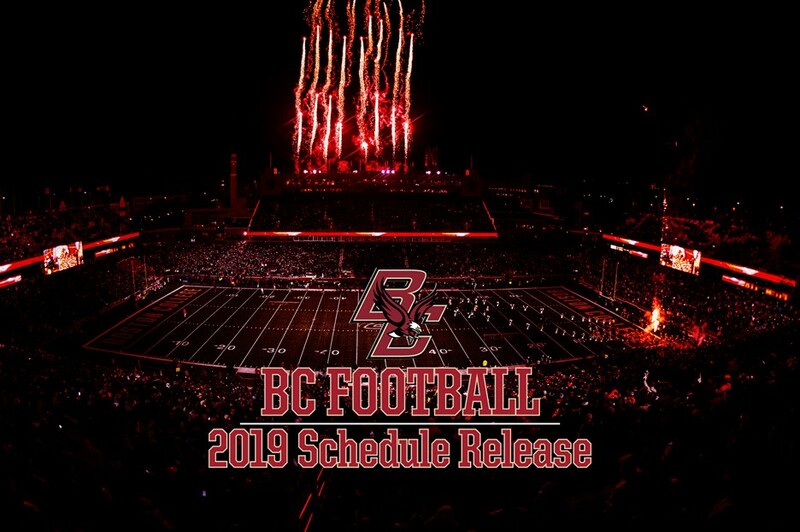 Season tickets are now available for the 2019 season by visiting BCEagles.com or calling 617-552-4622 (GOBC). Kickoff times and broadcast information will be announced at a later date.